2 What Is a Whole House Water Filter? 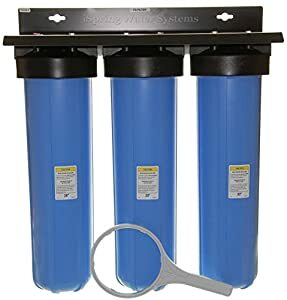 3.2 What Type Of Whole House Water Filter Do I Need? 4.1 Do I Need a Whole House Water Filter? 5 How Does a Whole Home Water Filter Work? 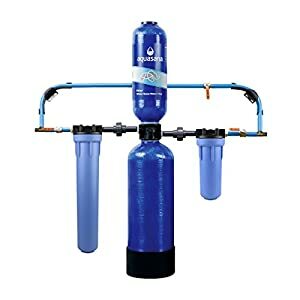 6.1 How To Install Whole House Water Filter? 6.2 How Do You Change a Whole House Water Filter? But did you know that the best whole house water filters are also more environmentally friendly to use than other filtering systems? In the following article, we take a closer look at how whole house water filters work, at the advantages and disadvantages of using them. We also present the best 6 whole house water filter reviews and explain why each of them made it to the top of the list. Care to know how a whole house filter works? We prepared a short buying guide explaining how these systems work, what they’re good for, and what you should look for in a model before buying one. The Home Master 2-Stage Filter is an effective unit that is capable of removing any particles larger than 1 micron from your water source. The filter uses a four gradient density filter to deliver a finer filtration than other models, and you will be able to notice the difference in the water’s taste and clarity. 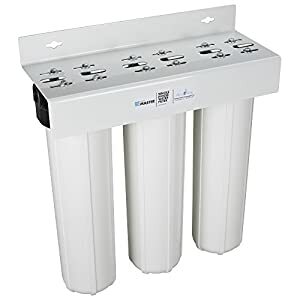 This is a very efficient water filter, and it will stop most chemicals and sediments from entering your water, including heavy metals, chlorine, chloramines, and other contaminants. The catalytic carbon filter used by this system has a water filtering capacity of 95,000 gallons, so it should provide filtered water for a year or more, depending on your consumption. One of the advantages of choosing this type of filter is that it comes with a 2-year warranty. This extended warranty period is proof of the manufacturer’s trust in this product. Good Instructions Manual – This product comes with a good instructions manual. The manual will guide you through the installation, and it will also guide you through the filter change operation. Poor Water Flow – This system has a maximum output of 10 gallons per minute. This water flow might not be enough for some households. This is a very effective water filtration system, and with a 1,000,000 gallon water filter, this is considered a low-maintenance unit. The model we’re presenting here comes with the pro grade install kit. This kit includes brass fittings, a pre-filter, a post-filter, and all the supports and shut-off valves you will need for the installation. One of the advantages of choosing this model is the increased longevity of the water softener cylinder. The cylinder has a filtering capacity of 1,000,000 gallons, so it should last for 10 years or more, depending on your water consumption. The easiest way to keep track of the consumption is to write down the original value of your water meter and check it over from time to time. Another advantage of using this model is the pro installation kit it comes with. All the components included in this kit are top-notch, so you shouldn’t have any problems with leaks or faulty parts. Good Filters – The filters used by this system are high-quality, and you will notice the difference in your water’s taste and smell as soon as you start using them. Pex Crimper Needed For Installation – This system needs a pex crimper for the installation. Not many people own this tool, but professional plumbers do. 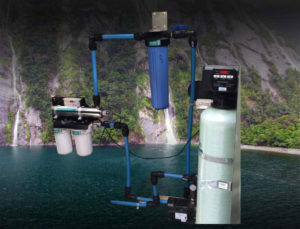 This is one of the most popular whole house filtration systems, and it has a very good price – value ratio. The water filter has a filtering capacity of up to 15 gallons per minute, depending on your water pressure. One of the advantages of using this filter is the high-quality sediment filter. This filter is very efficient, and it will remove any particle larger than 1 micron from the water. The resulting water will be crisp and clean, and it will pass through an activated carbon filter before reaching your faucet. The activated carbon filter has good longevity, which is always a good thing. The filter has a filtering capacity of 100,000 gallons, enough to last for up to a whole year or even two, depending on your water consumption. Efficient Filtration – This water filter is capable of removing up to 95% of the contaminants in your water source. It is efficient at removing iron, sediment, manganese, and other chemicals that might alter the water’s taste. Not All The Iron Is Removed – If your water source is heavily contaminated with iron, this system might not remove all of it. However, it will remove more than 90% of it, so it might not bother you too much. This whole house filtering system is certified by the NSF to remove any particles larger than 5 microns from the water, so it will be very effective. The filter is capable of removing up to 95% of the contaminants in your water, including chlorine, sediment, herbicides, pesticides, rust, and other chemicals. One of the advantages of using this filtration system is its 100,000-gallon activated carbon filter. 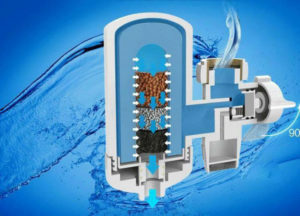 The filter has a great filtering capacity and it should remove most of the contaminants from your water for a long time. Some households use this volume of water in a year, while others do it in two. Another advantage is the 1” input and output ports the system uses. These ports allow up to 15 gallons of water to pass through the system and be filtered each minute, so you shouldn’t notice a sharp drop in water pressure when you install the system. 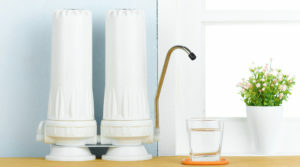 May Leak Without Teflon Tape – This water filter’s connections might leak if you don’t use Teflon tape. This is another popular whole house water filter, and after taking a look at its price and comparing it with its filtering capacity, we’re certain you’ll also be inclined to like it. One of the advantages of using the 3M Aqua-Pure is its huge flow rate. Unlike other water filters that ensure a good flow rate of 15 gallons per minute, this model actually goes the extra mile and delivers one of 20 gallons of filtered water per minute. This is a huge water flow, so you shouldn’t experience a drop in water pressure even if you use more faucets at the same time. Another advantage is its low maintenance. 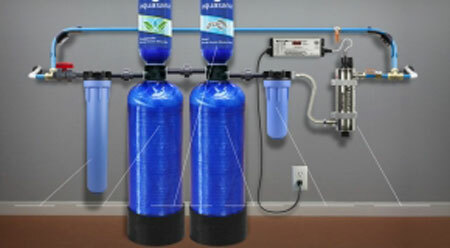 This system uses water filters that should last for a year or more in a typical outset, and changing them is very easy. You just have to twist them off and twist new ones in their place. 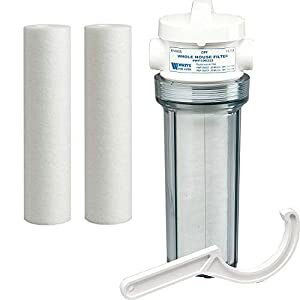 Great Filter – Not only is this water filter very effective at removing contaminants from the water, but it’s very easy to change as well. The filter will last for a year or more, and changing it will only take up to 3 minutes. Needs Help With Very Polluted Sources – You should combine this filter with a sediment pre-filter if your water is very polluted. This is the highest-rated whole house water filtration system on our list. As a matter of fact, it’s also the most popular model. Part of the reason for this model’s popularity is certainly its low starting price, and the other part is definitely its effectiveness. 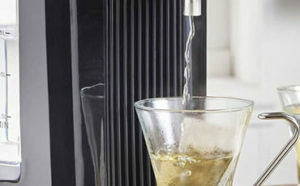 One of the advantages of choosing this type of water filter is that it comes with stainless steel inserts for an easy and leak-free installation. Unlike plastic inserts, these ones are more durable, and they are less prone to cracks over time. Another advantage of using this model is that it’s both NFS tested and certified. This is a sure way to know that the water you drink has been seriously tested and that it has passed even the harshest standards. Best Price/Value Ratio – With a low starting price and a very efficient water filtration process, this system delivers the best price/value ratio from all the other models we included on our list, and we only included the best. No Fixing Bracket – This unit does not come with a fixing bracket. This might be a problem for some people who prefer using one during the installation. Well, since you’re looking for a whole house water filter, you probably heard about them from a friend or family member. Some of you might actually be using a whole house water filter right now without knowing it. So, what is a whole house water filter? As you might expect, a whole house water filter is a filtration system capable of filtering all the water that enters your house. These systems are also called Point Of Entry (POE) systems because they are usually installed before the water reaches your heater, thus filtering both the cold and the warm water. This means that every time you open a faucet, filtered water will come out of it. Actually, filtered water will be delivered to your shower, washing machine, and even your toilet. Not all households need the same whole house water filters. Even though all models work in the same way, the presence or absence of additional filters will influence the types of contaminants a certain filter will remove from the water. However, there are some things you should take into consideration, no matter how many filters the system uses. Water Flow – Different whole house water filters will produce a different amount of filtered water each minute. Since all the water entering your home will be filtered, this will be the same amount of water reaching your faucets, showers, appliances, and toilets. Smaller households might manage using a water filter capable of producing only 10 gallons of water per minute, but larger ones surely won’t. If you know your household usually consumes large volumes of water at the same time (in the morning before going to school or work, or before going to sleep) you should buy a unit capable of producing a better water flow. Filters – Different filters block different contaminants. Depending on the results of your water tests, you should buy a unit which will be effective on the contaminants already present in your water. If there is high heavy metal contamination, a normal unit with a copper-zinc mineral filter might suffice. However, if you have high bacterial contamination, you might need a unit with a UV filter. Depending on the water test results and your household’s water consumption needs, you should take into consideration the following things before buying a whole house water filter. Filter Longevity – This feature is very important because most whole house filter systems need little maintenance. Changing the water filter is one of the few operations you need to make constantly. Not all the filters that can be used by a water filter have the same longevity. Sometimes you can opt for a 100,000-gallon filter, or you can choose a 1,000,000-gallon filter for the same system. Depending on your household water needs and consumption, you should choose a filter that offers good longevity and a decent price. Consumption – You should also take into account your household’s water consumption. It might seem like a good idea to choose a cheap filter, but if your household uses a lot of water, you might have to change it once every month. This might actually make the multiple cheap filter changes more expensive than fewer changes of more expensive filters. On the other hand, if your household does not use a lot of water and you choose a filter that might last more than 5 years, it can get clogged up and not work properly at the end. Balancing your household’s consumption with the filter’s longevity is essential if you want to buy the right kind of filter. Microns – Depending on the water testing results, you have to choose the right micron rating for your filters. The best filters available will block anything larger than 0.35 microns. As you might expect, they are more expensive than the filters that block only particles larger than 1 micron. A micron is a thousandth of a millimeter, so it’s already pretty small. If you don’t have a highly contaminated source, a 0.35-micron filter might be an overkill. One of the main reason people turn to whole house water filtration systems is the quality of their water. Even if you’re connected to a municipal water supply, the water reaching your faucet might have a dubious quality. One of the first things you can notice about the water is if it’s chlorinated or not. Chlorine has been used for decades as a water disinfectant in water treatment facilities. Some people are so used to drinking chlorinated water that the absence of it might seem strange at first. Even though chlorine is a pretty good disinfectant and it will remove most of the bacteria and other microorganisms in the water, it can actually bad for you. Recent studies have shown that ingesting large quantities can be dangerous to your health. Another reason you should avoid chlorinated water is that it has bad effects on your skin and hair. Your skin can be excessively dried when you wash it with chlorinated water, and your hair can take a dull aspect. Using a whole house water filter will reduce the amount of chlorine you’re exposed to, so it will have a positive effect on your skin’s and hair’s health. Using a whole house water filter is also more environmentally-friendly than using other types of filters or even buying bottled water. Unlike other water filtration systems, a whole house system does not produce wastewater. This means that all the water entering the filter will come out of it in the same quantity. When you’re buying bottled water, you’re actually growing your carbon footprint. First of all, bottled water comes in plastic bottles. Not all the plastic we use is recycled, so lowering the amount of plastic you buy is beneficial for the environment. Second, the bottled water is many times produced in one part of the country and consumed in another. This means it was most likely transported via trucks from one state to another. The transport increases the bottled water’s carbon footprint. It doesn’t matter if you’re connected to the municipal water supply, or if you take the water from a well in your backyard, the water you use could be better. One of the best ways to tell if a water filtration system is necessary is to test your water source. You can do that by either using a home water test kit or just by examining it closely using your senses. Depending on the answers you get from the tests, you can notice one of the following facts. Your water has small particles floating through it, or it’s cloudy. If you notice only one of the previous facts, you should use a whole house water filtration system. How Does a Whole Home Water Filter Work? Whole house water filtration systems might employ different mediums to filter out the contaminants in your water, but the basic principle they use remains the same. Here is a short explanation of how these systems work. The filter is usually attached to the main water line before the water heater, so all the water in entering home will be filtered. When the water enters the filtration system it will first encounter a sediment prefilter. This filter is specially designed to remove the larger particles in the water, like silt, sand, rust, debris, or sediment. However, this is not its only role. This filter also plays a key role in keeping the next filters functional for a longer period of time. Without this filter, the other filters would need more frequent changes. After the water exits the sediment pre-filter, it has to get through the activated carbon filter. This is one of the most important components of the filtering system, as it has a crucial role in removing a lot of contaminants. Activated carbon offers a huge porous surface. This surface is lined with nooks and crannies, and the contaminants in the water are attracted to them through a natural process called adsorption. 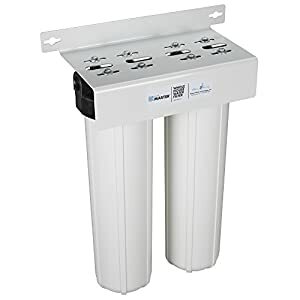 This filter is very effective, and it will remove most of the chlorine, what’s left of the sediment, any volatile organic compounds (VOCs), along with the foul smells and tastes from the water. Sometimes the activated carbon filter will also be treated with special substances to have different properties. Some manufacturers impregnate a small amount of silver in the carbon filter to give it an antibacterial capacity. When the water exits the carbon filter, it passes through a copper-zinc and mineral filter. This filter is also very important to the filtering process because it removes most of the contaminants remaining in the water at this point. This filter will remove what’s left of the chlorine, heavy metals, and it also has a good effect on bacteria and other microorganisms usually found in the water. The filter also does a pretty good job at diminishing the scale in the water. This is an optional step, and some water filters might not have it. However, some models pass the water through a water softener or a descaler. Some manufacturers use ion-exchange technology to achieve this. Find out the top rated water ionizers for your home with our review and buyer’s guide. When the water enters an ion-exchange filter, it will pass over some resin beads. These beads are filled with sodium ions. When the magnesium and calcium particles will encounter the ion-filled beads, they will replace the sodium ions. This will make the water softer, but it will also make it a bit salty. Other manufacturers use a salt-free water softener to maintain the water’s neutral taste. This is another optional step, but it’s more frequent than the water softener. 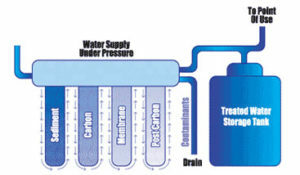 The post-filter plays an important role in producing high-quality water. When the water reaches this post-filter, it’s usually filled with very small particles because the larger ones would have already been filtered out. The post-filters role is to stop these small particles from reaching your water. These filters look like a mesh full of holes, but the size of the holes is what matters. Some post-filter holes are as small as 0.35 microns, but most of them measure 1 micron. Another optional but very efficient component is the UV filter. This filter is able to kill any remaining bacteria, virus, or microorganism that might have escaped the previous filters. If your water source has high bacterial contamination, using a UV filter will solve the problem. 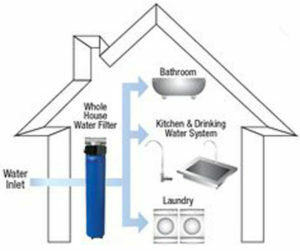 How To Install Whole House Water Filter? Whole house water filtration systems are not very difficult to install, but some people who are inexperienced with DIY projects might want to call for professional help. Here’s how you do it. Turn off the main water supply and drain the system. Choose the new location for the filter and mark it. Keep in mind you’ll have to change the filters constantly so choose a location you can reach comfortably. Cut the pipe using a pipe cutter. Install the filter with the “in” and “out” ports facing the right directions. Turn the filter’s inlet valve off and turn on the main water supply. If there aren’t any leaks, turn the inlet valve on. Check for leaks again. The installation is complete. Every time you need to change the filter, turn the inlet valve off and use the provided wrench to take out the cartridge filter. How Do You Change a Whole House Water Filter? Changing the filters can vary between models, but most follow the same principle. When you have to change the filter, turn off the water filter’s inlet valve. Use the provided wrench to screw the filter off, and keep a bucket close at hand to collect any dripping water. Clean the inside of the filter using a clean dry cloth. Insert the new filter and tighten it up using the filter wrench. Turn the inlet valve back on. Allow the water to run for at least 10 minutes for the filter to activate before you taste the water. Check out the refrigerator water filter reviews from the unbiased experts you can trust. We’re confident that after reading our whole house water filter reviews and the comprehensive buying guide we prepared, you’re ready to make an informed decision about which system better suits your needs. 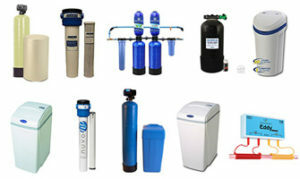 Finding the best whole house water filter is not equivalent to finding the most expensive one. Each water filter is better at removing some contaminants and less effective at removing others. That’s why you have to know what the filter is supposed to block, so you can choose the right model. 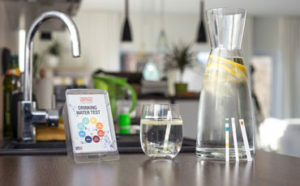 Using a home test water kit, you can determine the contaminants present in your water in about half an hour. With this information in mind, you will be able to find the right model in no time whatsoever. If you don’t believe a whole house filtration system is the right option for you, check our other buying guides for more information about water filters.